Stephenson’s Rocket: an abundance of speed. In my last post summarising some of the key ideas in Joshua Goldstein’s book on long waves, I looked at the different schools and some of the evidence. In this one, I’m going to look at the model he constructs on the dynamics of a long wave, and its link to innovation. (Discussion of the war school(s) will follow in another post). But I also realise that I haven’t spent enough time on his work on whether long waves or long cycles exist at all. So I’m going to start there. I’ve reassembled the dates he derives from these into a spreadsheet, which still needs some work to extract the dates as charts. But it does suggest that there is reasonable consistency between the dates of different scholars working in different schools, and that there are reasonable regular cycles of downswing and upswing. Which isn’t to say that cycles are exactly the same length, or would need to be for the theory to hold. Goldstein quotes Kondratiev, who argued repetition is more important than periodicity. The “regularity “of long waves should refer not to periodicity but to “the regularity of their repetition in time” and to the international synchrony of different economic series. Physiologists do not argue about whether breathing occurs . Nor do they assume that this regular, repetitive phenomenon is always absolutely identical in form or length. … [Nonetheless] all animals breathe, repetitively and reasonably regularly. From this Goldstein found himself able to conclude that long waves do exist. Then, based on the statistical analysis that I touched on briefly, he reviewed the main hypotheses, on the economic factors influencing long waves, of different scholars, looking particularly at hypotheses from different schools or scholars that contradicted each other, and which therefore could not both be true. The third step in building up this picture was to look at the leading and lagging indicators of change, which Goldstein portrays as a wheel, a literal cycle. It’s worth walking through this. The whole cycle is around 50 years, although this should be taken as a guideline rather than a rule. The downswing runs down the right hand side of the wheel, with production hitting a trough at around ten years, and investment at about 15. Because, on his analysis, innovation peaks just ahead of the upswing, we see that peak at around 20 years. After around 25 years, the downswing moves into an upswing (and as discussed in the previous post there are multiple interpretations as to why). The upswing is a mirror image of the downswing; production peaks about ten years into the upswing, with an investment peak following 15 years in, and finally an investment trough just before the upswing runs out of momentum. But there’s a problem here. The question of when innovation occurs in the cycle has been central to discussions of long waves, even though the innovation school, descended from Schumpeter through Gerhard Mensch and Christopher Freeman, is only one of three economic schools, as discussed in the previous post. The reason it’s central is because it’s also a question that’s implicit in both the other schools. If capital investment starts to increase again, why does that happen? Or, looking at it through the lens of the “capitalist crisis” school, how is it that the crisis, which has triggered the downswing, get resolved? The answer, in brief, is that leading edge production becomes reorganised or reinvigorated in some way to improve the returns on investment. The problem I have with Goldstein’s characterisation of the innovation peak coming five years before the end of the downswing is that it seems too late to permit such reconfiguration; there simply isn’t enough time to do it. It’s worth considering a couple of the dates of the Troughs from Goldstein’s base case to explain what I mean. The date of the Trough at the end of the last downswing is around 2000 (I’m using Markku Wilenius’ estimate here), so T-5⋍1995. The world wide web might therefore qualify as such an innovation; Tim Berners-Lee had written the code by 1989 (though his first iteration was much earlier) but the first commercial application was by Netscape in 1994, although the available market was tiny (less than 5% of homes in leading markets such as the US and the UK.) The end-date for the previous Trough was 1940, using Goldstein’s base case data, T-5⋍1935. And you can date some significant innovations from this time, such as the monoplane and the television, though again, the initial markets were small. But all three of these innovations (browser, plane, television) were resting on innovation cycles that started much earlier: the earlier 1970s in the case of Netscape, the early 1900s in the case of the monoplane. It’s the difference between a “follower” technology and a “platform” technology. So it comes down to what type of innovation we’re talking about. And I think that Goldstein is actually talking about an application, as Drucker would put it; the full set of systems that allow a product or service to start to make a market. Successful capital accumulation either runs up against limits imposed by the existing institutional structure or begin to destabilise that structure. … (p23) an economy that expands within the same social structure of accumulation is likely to encounter diminishing returns to continual expansion. For me, this connects, at least intellectually, with the work of Carlota Perez. Her model describes each wave, or “surge” as made up of two parts: an installation phase, driven by finance capital, and a deployment phase, driven by production capital, separated by a crash. (There’s a fuller explanation here). The engine for the next upturn (deployment) emerges from the end of the previous upturn. Here’s why: as the core technology of a deployment phase saturates its market, returns start to fall, and capital starts moving to new, and more speculative, areas, looking for a better rate of return. Each of the Perez surges, which map well enough onto the Kondratiev long cycles, is started, at least in hindsight, by an innovation which opens up a new type of abundance. The Intel microprocessor opened up an abundance in 1971; the Henry Ford production line in 1908/1913 opened up an abundance of things; Stephenson’s Rocket (1829) opened up an abundance of speed. And so on. But it takes societies time to build up the knowledge, institutions, business models and social practices to make the most of this new abundance, to turn it into a new technology platform and a new market. (It’s also worth noting that it’s me that’s making the connection between the two schools, and I could be misrepresenting her thinking, since none of the leading SSA authors are in her index or bibliography. Process innovations in basic sectors. I’m not going to go into this here in any detail, since this post is already on the long side. But I suspect that to get to a fuller understanding of the dynamics of long waves, we need a richer understanding of different types of innovation and how they play out at different points of the cycle. For example, the ten years between the Trough and the production peak in Goldstein’s model is, I suspect, when process innovations are at their most intense. That’s certainly what’s happened in the ICT wave. 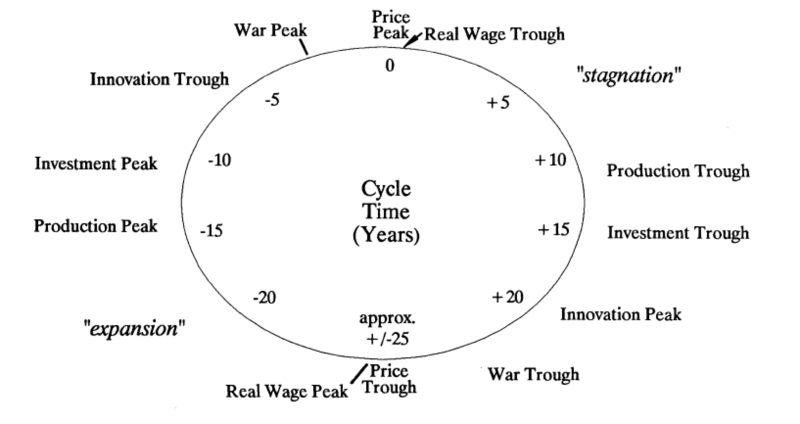 The ‘war peak’ and the ‘war trough’ on the diagram is worth more than a passing comment. So, for now, it will have to wait: other than to say that Goldstein argues reasonably convincingly that war is linked to economic cycles. 1. Thanks to Francis Green for pointing me to the Social Structures literature. Other posts on long waves can be found here. Thanks very much, Andrew – a great post and a prodigious amount of work, much appreciated. I know all too little about long wave theory to be able to critique these thinkers, but am intrigued by the concepts. The big challenge seems to be identifying processes – from fundamental anthropology, psychology and ecological economics – that can plausibly generate the waves/rhythms. Here are three possibilities – not mutually exclusive at all – that come to mind as ideas to explore. First, J Tainter’s theory of civilisational collapse as a gradual result of diminishing returns from complexity. Second, M Olson’s theory of dysfunction in collective action as a result of accumulating institutional and personal vested interest. ( Both of these build on a principle I think worth elaborating, namely that ‘nothing fails like success’ in the long run, as institutions and individuals hold to patterns of production, consumption and investment that have been successful, even as the world around them evolves in ways that will make them ever less effective.) Third, warfare plays a role in several ways: destruction of vested interests and ‘blocking institutions’; destruction of capital and opening up of spaces for innovation; motivation for rapid change to improve conditions after destruction; mobility within and between societies. None of which makes the case for war; but it does point to ‘what it’s good for’.